Rurouni Kenshin (sometimes known by the title Samurai X) is a manga and anime series that grew to great popularity around the turn of the millennium in both Japan and America. Half-fighting and half-romance, Kenshin is a historical fiction set in the years after Japan's final civil war and dissolution of the samurai caste. 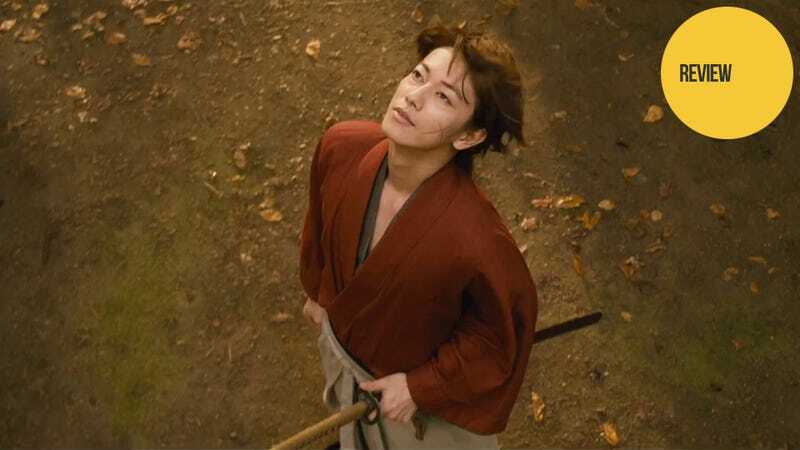 It follows Himura Kenshin, one of the civil war's greatest warriors, who has given up killing and now wanders Japan seeking nothing more than a peaceful life. Yet he finds himself constantly confronting the ghosts of his past. Now, over ten years since the height of the franchise's popularity, comes its first live-action film. And while some have worried that this film would be nothing but a cheap attempt to cash in on the name, Rurouni Kenshin truly is an excellent film and perhaps the first step in revitalizing the franchise. This live-action adaptation covers a mix of the first two story arcs of both the anime and manga. It deals with Kenshin fighting an opium dealer who is trying to carve out his own little kingdom in the heart of Tokyo and with a killer claiming to be Kenshin himself. The film also contains flashbacks to Kenshin's past during the civil war and includes the story of how he got the first cut of his cross-shaped scar. While Kenshin retains his outwardly clueless appearance—including his "Oro" catchphrase—from past versions of the story, much of the slapstick humor has been removed from the overall story, making for a more serious tone in the film. That's not to say that there aren't any great lighthearted/funny moments, but that overall, the story is treated with a large amount of "life-or-death" seriousness. And as with most movies, there are a few minor changes in the adaptation—and one or two semi-major ones. But all of these changes help the movie to be a stand-alone film (as opposed to part of a greater series) and to give each character a complete story arc regardless of whether the manga/anime did or not. Right from the start Rurouni Kenshin shows its excellent direction and fight choreography. The fights are very fast and exciting, with both changing choreography and camera techniques used to keep the action consistently fresh and interesting. Moreover, everything is done with practical effects—meaning there is no CG (except for the blood spray) in the entire movie. There is some amount of wirework, but unlike that in Crouching Tiger, Hidden Dragon, it is used for making the characters move incredibly fast or slide across the ground instead of making them fly—adding a bit of the spectacle without looking fake. This makes everything in the film seem far more real and entertaining than many recent CG fests. One of the most surprising things about Rurouni Kenshin was the music. While it would have been simple to reuse the music from the anime or create a stereotypical "Japanese" soundtrack heavy on the Japanese flute and the shamisen, the score instead sounded more like something out of Berserk—it matched well and made everything more dramatic and exciting. The cast for Kenshin is amazing and the actors channel their characters expertly—from Kenshin and his "Oro" face to Sanosuke's rough and tumble attitude. Yahiko does a great job in a semi-tough role for a child actor and the cast of villains—especially Kanryuu Takeda—are excellently over-the-top. comparison to Kaoru, is supposed to be a bombshell. Yet despite Megumi's actress being quite pretty in her own right, Emi Takei is even more beautiful. So while Kaoru is treated as the underdog beauty-wise in the film, she is anything but. It's not terrible, but it does stand out as a case of miscasting. Going into the film I was expecting a mediocre, cheesy retelling of the Kenshin story, suitable only for diehard fans of the series. But Rurouni Kenshin completely blew away my meager expectations. It was not only a good adaptation but also a good movie in its own right. The sword fighting is amazing, the directing is brilliant, the casting nearly perfect, and the story is told correctly for its new, two-hour format. Simply put, aside from Gyakuten Saiban, Rurouni Kenshin may be the single best Japanese live-action adaptation I have ever seen. Rurouni Kenshin was released in Japanese theaters on August 25, 2012. There are tentative plans for an international release.